So many people care for this “tough,” versatile plant. 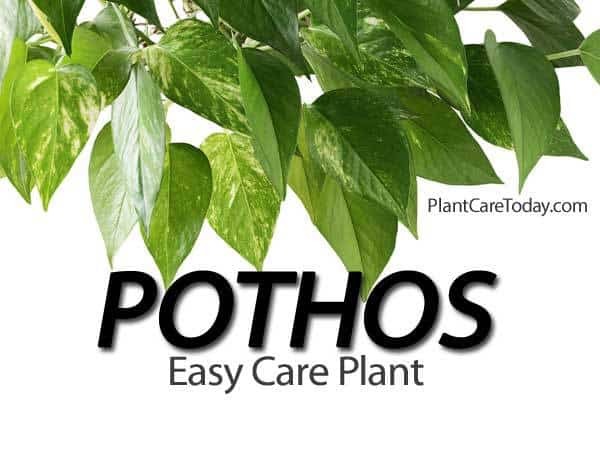 You’ll find it growing small pots, hanging baskets, totems and even as the only bit of green they see all day – a vine hanging in their office cubicle; the Pothos needs only basic plant care instructions. The Pothos comes to the indoor houseplant world from Southeast Asia and to narrow it down more – the jungles of Malaysia. The botanical name is – Epipremnum – but Pothos is much easier to pronounce. When caring for any plant indoors – watering, pest control, and light are all important but – light – is at the top of the pothos plant success list. For Pothos natural but bright indirect light would be my preference. You don’t want the leaves of a Pothos sitting in direct sun – a northern exposure with sunlight coming through fully opened blinds will serve the plant well. If grow lights are the only option, 12-14 hours per day should keep the Pothos in great shape. Since we’re on the subject of light – many people do not understand how light or lack of it affects plants. Usually, houseplants don’t get enough light. When Pothos doesn’t get enough light the new growth – stems get smaller, thin and weak, the new leaves “shrink” in size. This change doesn’t happen overnight; it can take months of low light levels to see the effects. Now Pothos when exposed to direct sun or too much light will slowly lose that rich, lush color – and slowly turn a pale green. Root system – how good is it? As a general rule check the soil. Water the plant when the top inch of soil feels dry. When watering any indoor plant make sure to water the complete rootball and not just the top. Saturate the entire soil mass and pour or drain the excess water off. The water quantity will vary depending on the amount all the items listed above. The Pothos is not much different than most houseplants. If the plant receives too little water the leaves will begin to wilt; older leaves often turn a bright yellow. This is why it’s important to thoroughly water the entire rootball. 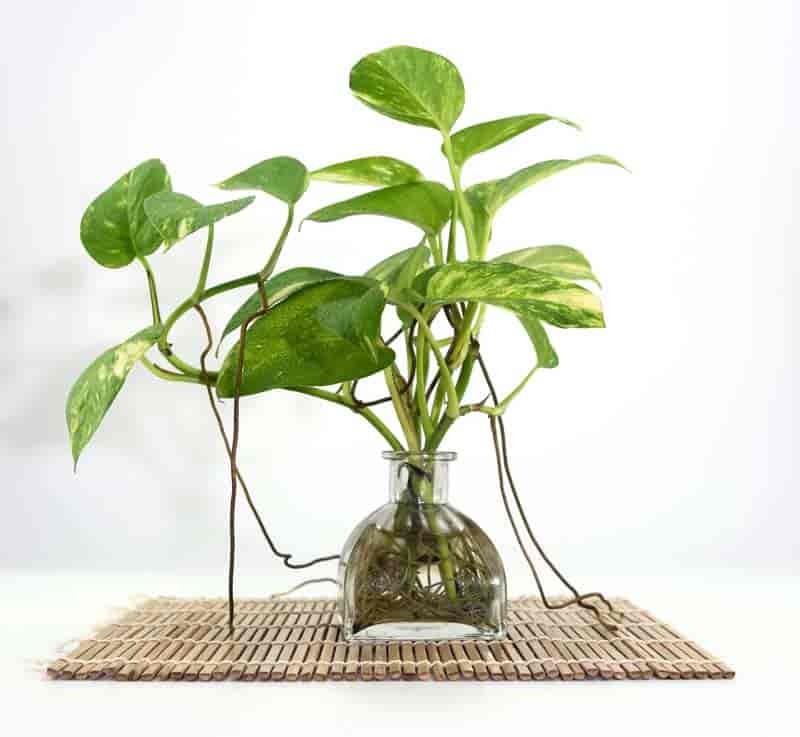 The root system of Pothos is small compared to other indoor plants. When the plant is over watered, and the soil stays wet the roots will rot. In turn, the leaves begin to wilt, and the leaves lose their healthy look turning to a pale dull green color. If possible use distilled or rainwater the next best would be filtered water. The purer the water, the better. Many growers have installed systems to get remove any minerals before watering the plants. Description: Scindapsus aureus and its varieties are the plants called “pothos” by florists, which are known also as “devil’s ivy.” Scindapsus aureus has waxy, dark-green leaves splashed with yellow. In juvenile form, the leaves are broad pointed ovals, normally less than 6 in. long. At maturity, plants in satisfactory growing conditions have leaves 2 ft. long, cut and perforated like those of Monstera. ‘Marble Queen’ is the most popular variety; its foliage may be more white than green. ‘Orange Moon,’ Silver Moon,’ and ‘Yellow Moon’ are newer varieties with coloration varying from apricot through creamy yellow to pewter. ‘Wilcoxi’ is similar to S. aureus, except that its yellow streaks start and stop more abruptly instead of blending softly with the green. Scindapsus pictus has larger, more leathery leaves than the other Scindapsus in cultivation. The dark-green leaves display large areas of silver variegation. Scindapsus pictus argyraeus is similar but has smaller, more delicate leaves of iridescent blue-green, spotted with silver. Culture: Almost the same as for Philodendron, except that scindapsus plants need to become nearly dry between waterings. In addition, they show a marked preference for tropical warmth. Abundant light tends to increase foliage variegation. Remember the Pothos comes from Malaysia. They like the same temperatures you do – 65 to 85 degrees Fahrenheit is best for steady growth. I’m not a big fan of using fertilizer on indoor plants. Most houseplants purchased in a good soil with all the needed nutrients sitting in the soil and should hold the plant for a long time. In the case of plants planted in a poor soil mix the Pothos responds well to very light doses of fertilizer. If I had to fertilize – for homeowners – I would recommend a liquid type like Miracle-gro plant food instead of a solid or granular. When Pothos receive “good growing conditions” as described above they can grow all year, For those of you up north with Pothos, you may notice a slow down during the winter months. One true advantage the Pothos offers – they’re easy to find, and it’s a great plant to get started with and learn how to care for indoor houseplants. Why is it the NUMERO UNO? – Versatility! Pothos plants are popular indoors because they are easy to grow and survives under the care of someone who has no green thumb. Conditions like cooler temperatures, lower humidity, and lower light levels. In south Florida you’ll even find the pothos growing in full sun. Over the course of the year the average professional plantscaper uses more pothos than any other indoor plant. Pothos does have some conditions that must be monitored for success. The number one area to watch is the root system. Pothos doesn’t like wet feet. The pothos does not have a deep root system and can very easily be kept with too much water in the soil. Under lower light levels and cooler temperatures the soil should be allowed to dry about half way down. Try not to soak the soil but water lightly around the entire pot. Pothos are grown from leaf-eye cuttings. Especially with the golden pothos growers try to select cuttings from plants that have a high marbling of yellow and green. The higher the light the brighter the yellows. The average 6 or 8 inch pot can have 15 to 35 cuttings, with each one producing a new plant. With that many plants making up one pot you can see how important it is to not over water these plants. If you find plants that are “underrooted”, make sure that the pot does not sit in water. Drain the excess water off. Keep the plant on the dry side. Before you buy a pothos, pop it out of the pot, and look at the roots. You should see a healthy root system that looks full and active. Over-watered pothos plants have mushy roots and rotted stems which pull out of the pot easily. During the year as your pothos grows you’ll need to prune it back. Be selective and trim the vine back to 2 inches from the soil line. This will help promote new growth and make the plant fuller. Don’t stick the cuttings back in the container. If you want to try your hand at starting the plant from cuttings, place the cuttings in a different pot and keep the pot small. The keys to success in growing pothos the #1 indoor plant is simple. Look for a plant that is well rooted, free of any insects or disease and easy on the water. There are 4 main varieties of Pothos – Pothos Gold, Pothos Marble Queen, Jade Pothos and the Neon Pothos. Overall, the Pothos Gold or the Golden Pothos grows through its trailing stems as they climb up trees and totem poles. The heart-shaped leaves on these trailing stems are glossy and dark green in color with yellow streaks. Pothos Gold, also known as the Devil’s Eye, is considered as a strong climber on a tree, or wall, or on totem poles. This growth behavior makes the plant ideal for hanging baskets and moss-covered poles. In addition to being a popular houseplant and a decorative plant, Golden Pothos or Pothos Gold are believed to be efficient in removing indoor air pollutants. The addition to the Pothos family is the Pothos Neon or simply Neon. The name “Neon” came from the colors of the plant leaves – bright lime or chartreuse green that really looks almost neon. Neon Pothos is a 2-foot trailing vining plant. Its low growing habit coupled with its elegant creeping stems make it a perfect plant for hanging baskets. Neon Pothos makes a great gift because of its simplicity and captivating foliage that really stands out. The pothos plant care secret to keeping a Neon beautiful is to put it in a room of average temperature with bright light.